On January 16th a fire at a Day’s Inn Motel in Birmingham, AL, claimed the lives of four coeds from MUW: Alondan Turner, Catherine Muse, Jamelia Brown and Jaslynn McGee. Alondan and Catherine were cousins from Cordova AL; Jaslynn McGee was from Corinth, MS and Amelia Brown was from Grenada MS. All four lived in the same dorm. Fire officials reported that the young students were among those who called 911 to report the fire, but firemen were unable to reach them in time. Shirley Spain, president of the Birmingham MFAeA chapter, learned about the fire when she received a call from a Birmingham News reporter. She expressed her sympathy and concern for the families and soon became the face and voice of MFAeA in responding to the families of the victims. As President of the Birmingham Chapter of Mississippi’s First Alumnae Association, I received a call from a Birmingham News reporter asking for my comments about the Hoover motel fire in which four students from MUW had died. This was the first I heard about the fire. I had not even known that the two cousins from my county were attending the W, but I expressed sympathy on behalf of alums and was quoted in the article. I made calls to friends in the area to get information about the families of the victims and finally located Mrs. Anne Muse, the Grandmother of the cousins. She told me they were the daughters of her son and her daughter and they had been very close all their lives. When I visited her home carrying food as is the custom here, she was out but I had a conversation with Catherine Muses’s father. He was heartbroken. He told me about his conversation with his daughter the night of the fire. He told her he was on his way to them but knew he could not get there in time to help and that she should call the fire department, police, etc. After our visit, he pointed across the lawn to the Turner home and I left him to visit with Alondan’s mother. She told me her daughter had lost her father some five years ago and that had been hard for her. She showed me her Prom picture from high school. We exchanged phone numbers and I have kept in touch with her since that visit. Although I was not able to attend the funeral, I arranged for flowers to be sent from MFAeA conveying the love of W alums. Later, when MFAeA’s Board of Directors approved the creation of a Memorial Scholarship, I was anxious to get this information to the families of the students. Nancy Stone, a writer for a popular web site was in Birmingham taking care of an elderly aunt when the fire occurred, was touched by the tragedy and wrote a moving article about it for The Huffington Post. I emailed her hoping she would be able to help get out the word about the Memorial Scholarship. She telephoned me and we had a wonderful conversation prior to her next article about the tragedy. In her follow-up about the fire, she mentioned MUW and the “long blue line” and praised MFAeA for creating the Scholarship. She also included information about how to contribute to the Scholarship fund and made a personal donation. I had contact with Mrs. Alondan Turner several more times. She invited me to speak on behalf of MFAeA at a Candlelight Vigil sponsored by the NAACP and Zion Star Baptist Church. 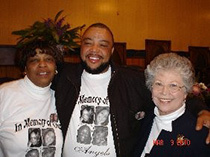 Both Mrs. Turner and Alondan were called “Angel” and at the Candlelight Vigil relatives wore shirts with Angel and Cathi’s picture on them. Participating in the Candlelight Vigil was a very special experience for me. I spoke for about seven minutes telling the audience about the W where the girls were students. I related some of my experiences as a student there some forty odd years ago and announced the creation of the Memorial Scholarship to honor the students’ memory. I was able to meet the other two parents and various relatives. My presentation was well received and I provided leaflets with the names of the young women being honored and the address of the Treasurer for MFAeA. But now, we’re friends till the end of time. We met one September, I’ll always remember. And as we leave here, may we always be Friends. It is this friendship born of commonalities that binds alums of the W together. We may have attended in different years, but the experiences and how they shaped us are the same. In that carefree time when we are no longer children, yet not fully responsible adults, friendships of a lifetime are forged. Accordingly, when word spread of the loss of four young students, alums everywhere were saddened. An educator from New York was in Birmingham visiting an elderly relative, and wept as she realized this could have been her students. As alums mourned with the families of these students, there was an overwhelming desire to do something that would bring hope and encouragement to the friends and family after the tragedy of these deaths. From these discussions, alums have established a memorial scholarship to honor the memory of these young women, who though they never reached the point of graduation, are still very much a part of our “long blue line”. The Board of Directors of Mississippi’s First Alumnae Association established the scholarship fund as an enduring tribute that will enable other students to reach their full potential and fulfill their dreams. The young women whose lives were cut short by the events of January 2010 will never know the impact of their influence. The love of W alums across the whole country reaches out to their families and friends. I am proud to represent the MFAeA in announcing the memorial scholarship dedicated to the four young women who were students at MUW. The leaflets being distributed provide information for making contributions in memory of Catherine Muse, Alondan Turner, Jamelia Brown and Jaslynn McGee. 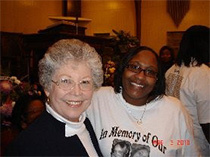 For more about the Memorial Scholarship Program of Mississippi’s First Alumnae Association or to find out more about making a contribution, visit “Latest News” at www.msfirstalumnae.com.